We provide you with all of the tools you need to generate and manage leads as well as reach out to leads we share with you. NewSign into your Partner Portal account to customize this guide. We built three seamless ways for prospective customers to download a trial and you to get the lead. And you can always ask to have additional leads shared with your account. Prospective customers have always been able to specify their preferred reseller. Now, you can include your name in the URL, and it's hardcoded into the trial form. You don't even need to use the trial link. If you use the preferred reseller parameter, the value is stored in the prospective customer's browser and used when they do download a trial. You can add this URL to your email signature or call it out specifically in a personal email to prospects or customers. You can adjust the settings with our Minisite Assistant. Download these customized email marketing campaigns. Each automatically includes your company name, URL, contact phone number, and logo. Your company name is inserted into any trial URL to ensure those trial downloads are linked to your account. See an example below and visit your partner portal Tools page for the full set of campaigns. We get new prospective customers contacting us every day. You can ask for a set to be shared with your partner portal account, after we reach out to the prospect to ensure they agree with the information sharing. Retrospect Backup is available as a free 45-day trial. Prospective customers do not have to request a consultation from an enterprise sales team or schedule a webinar with a pre-sales engineer. They can download it on the spot and start backing up in a couple minutes. Watch our video to step through the process. It's only 1 minute and 57 seconds. Every trial download generates a lead in our system. 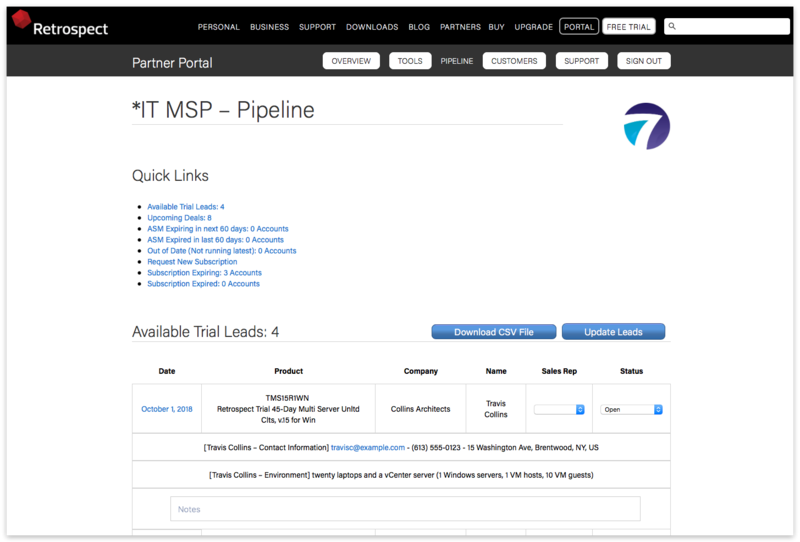 Leads coming from the trial page with you as the preferred reseller or from the minisite are automatically shared with your partner portal account under "Pipeline". You'll see the lead's name, contact information, and what their environment is. You can update their status, add notes, assign them to any rep in your organization, and download all of the lead information in bulk as a CSV file for Excel. Sign into your partner portal account to see the correct URL to use. When a prospective customer downloads a trial, we begin a drip campaign with personal sales touches and product information to get them up and running with Retrospect Backup. When you are listed as the preferred reseller (and you are loaded in our system with logo and contact details), we include your contact information and logo in the campaign. That prospective customer is your lead, and they'll purchase from you. Sign into your partner portal account to verify your details. 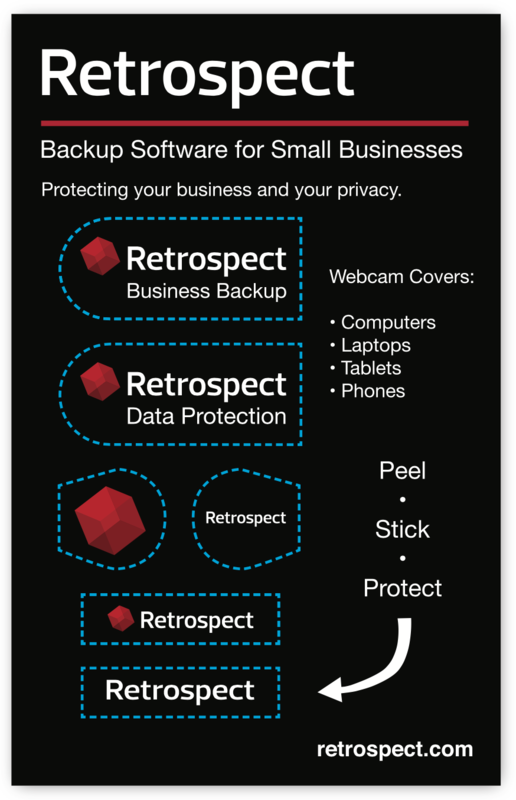 You can protect your clients' data and their privacy with new webcam stickers from Retrospect. Each set contains six stickers-designed for web cameras on desktops, laptops, phones, and tablets–and are made of white vinyl with no messy adhesive. Request your first pack today from your sales representative. They're free.